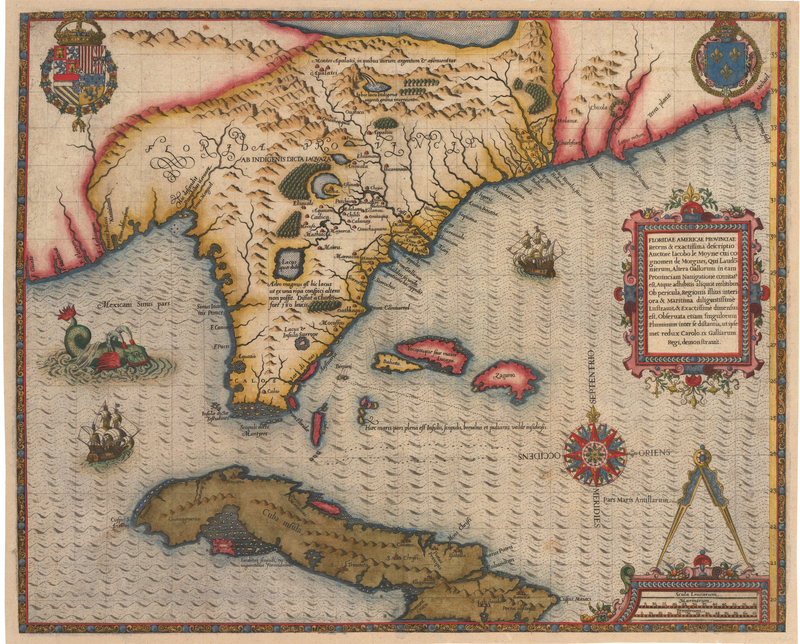 This map of Florida and the southeastern portion of what would become the United States is one of the most important 16th century maps of the region. Le Moyne's map includes the peninsula of Florida and the surrounding regions from the northern part of Cuba to "Prom Terra falg" or Cape Lookout. The map was a landmark for the region, containing significant new information (often inacurate) which became a primary source for other maps for the next 150 years. Le Moyne's coastline is usually correct for latitude, but the shore extends too far east rather than northeast in direction. He also added several lakes which endured in mythological proportions in the later cartography of the Southeast. Jacques le Moyne was a member of Jean Ribault’s expedition to North America in 1564 in what was an ill-fated attempt to found a Huguenot settlement in northern Florida. Historical evidence strongly suggests that le Moyne was chosen by the French monarchy to serve as official artist and cartographer to the expedition. In later life, having fled France at the time of the St Valentine’s Day Massacre in Paris in 1572, le Moyne settled in England where he became a highly regarded Elizabethan artist and botanist in London, with patrons such as Sir Walter Raleigh and Lady Mary Sidney. Condition: This exquisite map is in A condition.